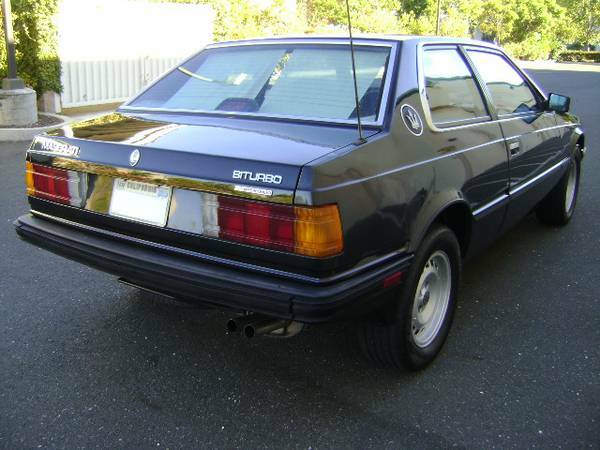 Standing on its own, apart from the history of its marque, the Maserati Biturbo is a pretty neat car. This is especially true when you look at it compared to similar size and class cars of the 1980s – the Biturbo looks a little like an E30 3-series from an alternate universe, with a twin turbocharged V6 instead of the 2.7 eta engine. That’s not to gloss over the issues the Biturbo had, but once one has made it this far without self-combusting or devolving into a sunburned shell with cracked leather and blown headgaskets, you know it’s either had an overindulgent owner, or it’s a good’un. 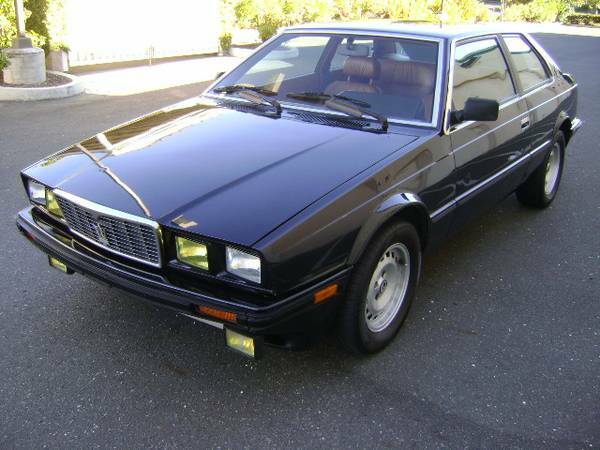 You can find this 1984 Maserati Biturbo for sale for $4200 in Hayward/Castro Valley, CA. This is more gloss than most have after 30 years, particularly at this price point. The owner has written a thorough, thoughtful listing with plenty of photographs, and more in this online gallery. Many of the survivors at this point either have cosmetic problems, are well overpriced because of their name and supposed collector value, or have the sad automatic transmission. This car has none of those issues – it’s a 5-speed, has solid driver-level cosmetics, and is priced reasonably. As you can see, owning one of these cars is not a financially winning proposition, but is that why we’re here? The seller has done all manner of work to an already-nice car, including rebuilding the carburetor, replacing all fuel lines, battery, timing belt, ignition module and crankcase breathers. The air conditioning works well and has been converted to R134a. It’s another question why some of those parts needed replacement on a car with 68,000 miles, but it’s nice that it’s done. Either way, the seller gives a very thorough, detailed breakdown without resorting to the all-caps or multi-color, multi-font strategy – he must know any potential buyer Biturbo is already financially and emotionally confused enough without having to be befuddled by additional tactics. Aside from his detailed listing of the interior condition, you can get a good idea in his pictures. Unfortunately, the earlier Biturbos did not get the cool analog clock of the later cars, but they do get a stopwatch for timing your 0-60 runs. 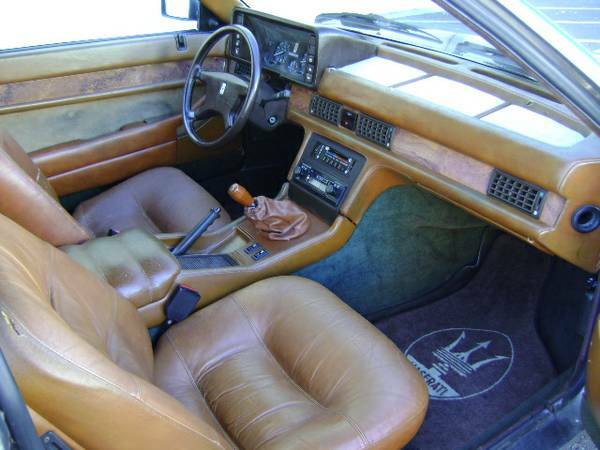 The instrument pod is not the most attractive, looking as if it comes from another car (or a truck), but the interior is in good driver condition – a minor split or two, but the leather is said to be soft. 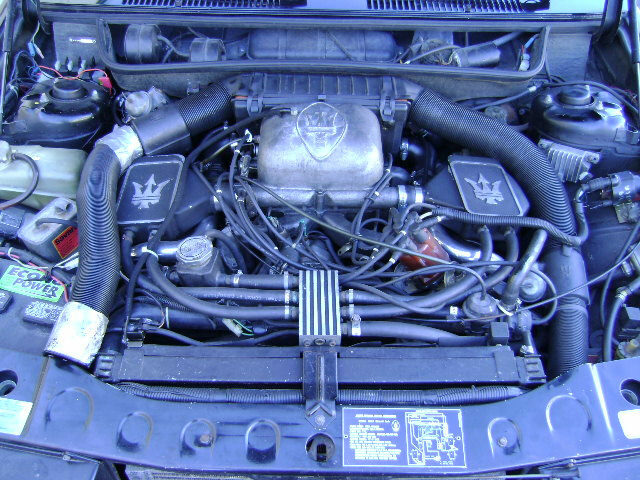 The car still has the full Maserati-labeled stereo system including speakers, and the only significant cosmetic issue looks to be a sagging seatback pocket. In spite of all the service over the seller’s four years of ownership, he does mention a couple of upcoming needs. While the car has always passed smog, with the carburetor rebuild the car has always run a little rich. So some tuning work should be on your agenda. Additionally, the starter solenoid sometimes clicks before the starter engages, suggesting it might be sticking, and the choke cable is also sticky. Those sound like relatively minor issues, but as the engine compartment is fairly tightly packed, access might make those hard to resolve. So with a car like this, would you ignore the reputation and take the plunge so you could feel smug every time you pass a 325es? This entry was posted on June 30, 2014 at 1:24 pm and is filed under Feature. You can follow any responses to this entry through the RSS 2.0 feed. You can leave a response, or trackback from your own site. This looks like a very well cared for example at a reasonable price. I remember looking at one in the showroom when they first came out & being particularly wowed by the plushness of the interior. I’d give this one a Leatherique once over to restore the softness. If I didn’t have my other project taskmaster in the garage (’81 928) I’d make this guy an offer. Oh and meant to say I really dig your site! Keep up the good work-lots of fun & unusual cars!